One of the bronze medals presented to the crew of RMS Carpathia, following their heroic rescue of 705 survivors of the stricken Titanic on April 15 1912, sold for £6,000 yesterday (28 September). The medal featured in Bonhams' Marine Sale in London, and comfortably exceeded its £2,000-4,000 pre-sale estimate. Overall, Bonhams' auction realised total sales of £555,000. The Carpathia was the first ship to reach the survivor's lifeboats, having received an emergency transmission from the Titanic when it hit an iceberg at 11.40pm on April 14, 1912. Diverted from her passage, RMS Carpathia came to the rescue of 705 passengers and took them to safety in New York. On arrival, the Officers and Crew were presented with medals by one of the saved First Class passengers, Margaret (Molly) Brown, to commemorate the rescue. Captain Rostron received a Gold medal and silver cup, the Officers received silver medals, and the Crew each received bronze decorations. 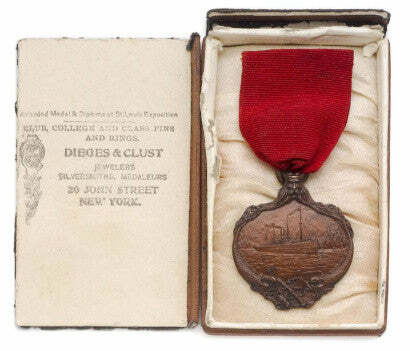 The medal is inscribed: "Presented to the Captain Officers and Crew of RMS Carpathia in recognition of gallant and heroic service From the Survivors of the SS Titanic April 15th 1912." Other lots in Bonhams' sale included a "fiercely in-demand" picture by the eminent Ramsgate-born maritime painter Francis Holman (1729-1784). Depicting the action between the fleets of Rear-Admiral Sir Samuel Hood and the French Comte de Grasse in Frigate Bay, St Kitts on 26 January 1782, the work eventually sold for £57,600.